HD plus HDD plus 3CCD -- the advantages add up. The HD Everio GZ-HD3 offers HD (High-Definition) recording with 1440 x 1080i resolution. These HD pictures are extremely fine and detailed, containing 4.5 times the visual information of conventional SD (Standard Definition) pictures. With a 60GB built-in hard disk drive you can record up to seven hours of HD video (in SP mode), plus you get two additional recording modes to select according to your requirements. Three 1/5-inch progressive-scan CCDs with Pixel Shift technology For bright, realistic colors the HD Everio uses three 1/5-inch CCDs -- one each for red, green and blue. Naturally, by having dedicated CCDs for each primary color, the camera is able to gather the maximum visual information which leads to more realistic color reproduction and presence. Using Pixel Shift Technology, the Red and Blue pixel locations are shifted relative to Green, allowing the sampled color information to be quadrupled through interpolation. Konica Minolta HD lens The HD lens of the GZ-HD3 was developed by camera specialist, Konica Minolta, to ensure that the lens performance was optimized for use with our 3CCD image sensor and MPEG-2 recording technology. The result is an extremely detailed picture with clear contrast and strong presence throughout the image -- the type of stable and consistent performance that becomes essential when recording images at HD specifications. The lens structure also contributes to the miniaturization of the camera. HD Gigabrid Engine for optimum HD images Developed specifically for HD Everio, this image processing engine processes the CCD images as a progressive scan signal. This provides the maximum image information to work with, regardless of the actual recording mode that is used. 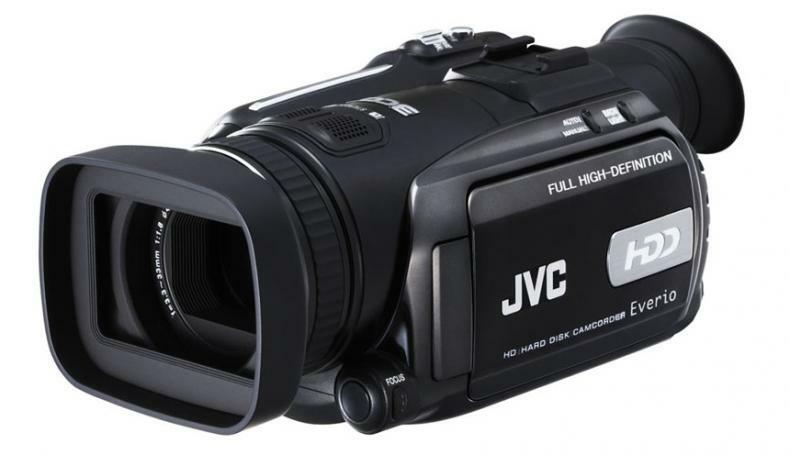 Also integrated into the chip are five digital noise reduction technologies that collaborate to improve vertical resolution by about 30 percent from previous JVC Standard Definition camcorders. It's at the heart of JVC's HD recording system. Built-in 60GB HDD for 7 hours of HD recording In addition to an SP mode that allows up to about seven hours of HD recording, the GZ-HD3 is also equipped with an XP mode that records at a higher bit rate for those extra special scenes. There?s also a 1440CBR mode, which is convenient for those who wish to edit using HDV-compatible software. Hybrid design with SD/SDHC memory card In addition to a built-in 60GB hard disk drive, the GZ-HD3 also has a slot for SD/SDHC memory card so you can store videos (SP mode only) and stills on this commonly available memory card. Compact body, simple controls To make it easy to take the GZ-HD3 anywhere, the palm-sized camcorder features a lightweight, compact body 27 percent smaller than the GZ-HD7, and weighing a mere 1.5 lbs. It also offers point-and-shoot simplicity so no crucial scenes are missed, plus manual controls for more ambitious users. ?Focus Assist function Focus Assist outlines in-focus image contours in color so you can easily tell which parts of the image are in or out of focus. ?Zebra function Displays a striped pattern across highlight areas on the image, making it easier to manually set the exposure. ?Auto illumination light Built-in Video Light automatically illuminates the scene if you are recording video in a dim environment. ?Program AE A full array of effects is available so you can choose the right exposure or shutter speed automatically according to the scene you're shooting. Easily accessible via visual menu dial. Accessory shoe and mic input Mount an optional microphone on the accessory shoe for clear, high-quality audio recording. A convenient Mic Input terminal with plug-in power supplies power to the mounted microphone. Multiple interfaces for expanded connection HD Everio accommodates a wide variety of usage environments with its full array of digital and analog interfaces. In addition to new HDTV displays, HD Everio footage can be viewed on conventional analog TVs as well, thanks to its down-conversion function. And with USB and i.LINK connectors, it's ready to transfer recordings to a personal computer for full-fledged editing. Windows/Mac applications provided for advanced editing For those who wish to edit and archive using their PCs, HD Everio comes supplied with full-fledged software. Blu-ray disc compatible applications let you store original HD content with full impact. And with plug-ins supplied for Mac software, Macintosh users will be able to create HD files using their own editing applications.